Childhood myopia, also known as short-sightedness or near-sightedness, occurs when distant vision is more blurred compared with near vision. The earlier a child gets myopia, the more likely he will get high myopia as an adult. Myopia tends to increase rapidly for children between the ages of five to 15 years, and usually stabilises by the early twenties. Childhood Myopia - How to prevent? Start young. Ensure your child learns good eye care habits from early childhood. 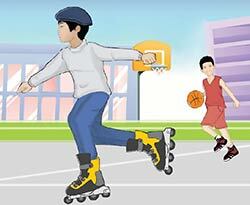 Encourage outdoor sports daily e.g. cycling, rollerblading, badminton, basketball, etc. Playing outdoors can help your child focus his/her eyes on a wide range of objects that are both far and near. Do not stay indoors in the classroom to read books during school recess time. Go outdoors to the playground to play. Avoid or minimise the exposure of young children to handheld devices, computer games or TV. These activities increase the risk of myopia, can quickly become addictive, reduce attention span, affect learning and creativity, and may lead to behavioural issues. Switch to audio books for the avid readers. Listening and even making audio books improve listening skills, pronunciation and expression. Take frequent eye breaks from near work or computer screen and look out the window into the far distance every 30 minutes. This breaks any accommodative (focusing for near vision) spasm and helps relax the eyes. Read with good or natural lighting. Maintain a good reading or working distance of around 30cm from the book. Do not lie down to read or read in moving vehicles. Watching TV from at least three metres away. Plan a daily home schedule or timetable for your child so that there is time (1-2 hours) allocated for outdoor activities. Spend time exploring and discovering the wonders of nature, e.g. bird-watching, picnic by the seaside, nature walks, etc. Childhood myopia arises from excessive growth and elongation of the eyeball. 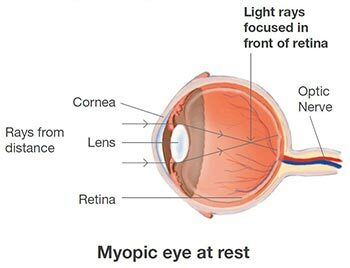 This results in light rays from distant objects focusing in front of the retina instead of on the retina. Distant objects are thus seen to be blurred but near objects remain clear. Genetic. Myopia tends to run in families. If one parent is myopic, the risk of the child developing the condition is twice higher. The risk is eight times higher if both parents are myopic. The increased severity of parental myopia leads to a greater risk of myopia. Environmental. Lack of outdoor activities and excessive near work like reading, playing games on handheld electronic devices or computers increases the risk of developing myopia. 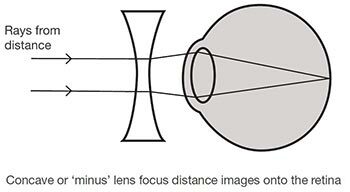 Putting on spectacles or contact lens helps to bring distant objects into focus. A child should be able to see well in each eye at all times without exerting extra effort in focusing. LASIK is a surgical procedure that thins the cornea (the transparent front layer of the eye). This is rather like creating a permanent contact lens on the cornea to bring instant images into focus. 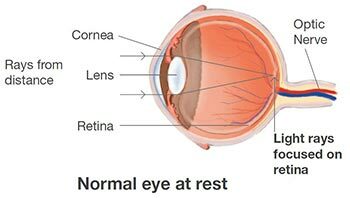 However, LASIK is a cosmetic and not a curative treatment, as the eye is still elongated retaining the same risk of retinal detachment, macular degeneration, etc., even after LASIK. Once the eyeball elongates, the change is irreversible. Therefore, prevention of myopia and delaying its progression early in life are important steps in management of myopia and its consequences. To ensure that your child does not become myopic, encourage him/her to adopt good eye care habits from a young age, even before he/she develops myopia. There have also been extensive studies and good evidence on eye drops (e.g. atropine) to slow down the myopia progression. Ask your doctor about the latest advances in the field and what is suitable for your child.